Patients have a very unique perspective on what they are going through. Yet health professionals tend to leave them out of the picture. Showing the importance of how health systems should get feedback from what patients want is Zoe Letwin. Zoe has a master’s degree in Professional Education and is currently a second year PhD student in the Health Profession Education field at Western University. Gathering up all her knowledge and insights, she talks about Inter-professional Pain Education and shares her competency-based framework that details the ways practitioners can create a competent person-centered partner in pain care. Zoe builds up from her passion about creating a culture of empathy in pain education and values lifelong learning, taking us into how the complexity of pain should involve everyone together. In this episode, we have a new and exciting topic. We’re discussing into professional pain education with Zoe Letwin. She has a Master’s degree in Professional Education and is currently a second year PhD student in the Health Profession Education field at Western University, which is located in Ontario, Canada. Zoe has extensive experience in medical education including working at the Schulich School of Medicine and Dentistry at Western University where she coordinated courses for the Undergraduate Medical Education Curriculum. Her Doctoral research includes developing the curriculum for the Interprofessional Pain Management with Master’s of Science Program. She is passionate about creating a culture of empathy in pain education and values lifelong learning. To support your learning with this workshop-style podcast, Zoe has provided all of us with a great free download. It’s the Integrative Pain Education Management Framework, which she created and is part of her PhD Studies. This image and framework would summarize much of what we talked about on this podcast. It’s something that you can refer too as you explore your own integrative education and venture into integrative pain care models. To download the Integrative Pain Education Management Framework, all you have to do is text the word, 128download, to the number 44222. You can open up a browser and type in www.DrJoeTatta.com/128download. 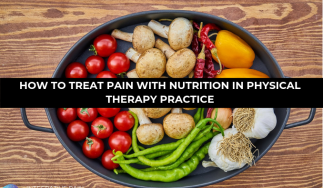 If you’re a practitioner and you’re interested in integrative pain care models, make sure you hop on over to the Integrative Pain Science Institute and check out the Nutrition for Chronic Pain Course as well as the ACT for Chronic Pain Course. 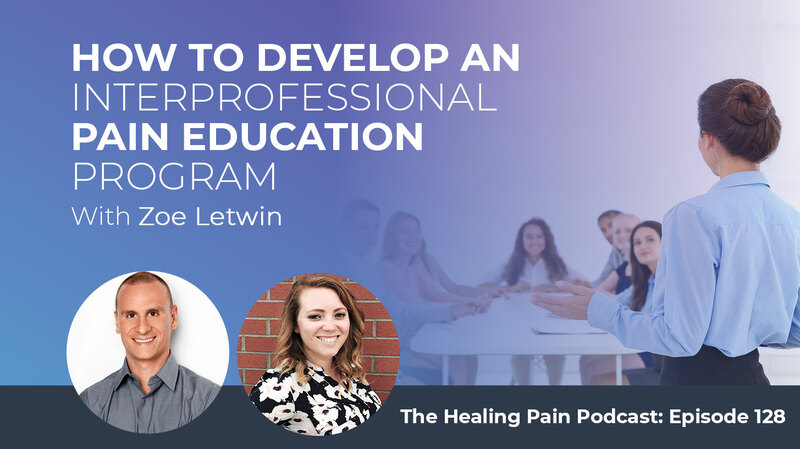 Let’s begin this show where we discuss interprofessional pain education with Zoe Letwin. Zoe, welcome to the show. I’m so happy you’re here. Thanks for having me. This is great. I was happy to run into you at World Congress, which is the World Congress on Pain given by the International Association for the Study of Pain. It was up in Boston. I was walking around the poster presentations and there you were. You had such a great poster with such great information on it. You and I started chatting about some of your ambitions in the world of pain and I was like, “I have to have you on the podcast because people are going to be interested in you, your research and some of the directions that you’re headed.” Tell us who you are first and what you’re up to right now. I’m a second year PhD student at Western University, which is located in London, Ontario. The program that I’m in is Health Professional Education, meaning that it’s combining education and health. I have a Bachelor’s in Health Studies. I did a Master’s in Education specifically on curriculum and pedagogy. It’s the perfect blend. I also have some experience working in medical education. I’ve worked at the medical school at Western as well and some few other roles that I’ve taken on. It was a perfect fit for me. You’re a second year. You have a year and a half or two years left to go? Two and a half and we’re hoping and crossing fingers. What drew you to the world of pain? To be honest, I have experienced chronic pain myself. When I met with my supervisor, Dave Walton, for the first time, we talked a lot about the quality of life. I always had that in the back of my mind. I still want to talk about pain because you do have to have some quality of life when you’re experiencing that. When we got into it more, he got a teaching fellowship. He wanted to develop a curriculum on pain management. This is a perfect blend of my education background, his experience as working as a clinician. He’s a physiotherapist, which is what you are too. I’m sure you’re interested in that. We talked more about it. I feel that being a pain patient myself, some people could see that as a bias, but I see it as a strength because I understand it and know it better than anyone else because I’ve lived through it. It’s so important that health systems get feedback from what patients want. Often practitioners create things, programs, products, services and patients don’t necessarily want it or it doesn’t quite fit because the patient has a very unique perspective on what they’re going through. Tell us first what your poster presentation was about at World Congress of Pain. The title of it was Developing an Interprofessional Pain Management Curricula for Clinicians in a Competency-based Education Environment. What I did was I conducted an environmental scan. This is at the very beginning of my PhD. I produced a paper out of that. 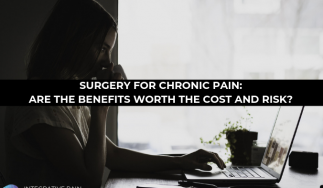 What we were doing was looking at the current climate and environment of pain management, specifically in the area of competency-based education. In doing that, I found that there was nothing. There isn’t a Master’s level program that’s using both interprofessionals in a competency-based framework. There are programs that could be weeks long or maybe they are a Master’s program, but they’re not necessarily around this competency-based framework. Can you explain what a competency-based framework means? Competency-based is not new. This has been around for a while. It is becoming more popular in medical education. Basically, instead of focusing on time-based tasks, a test or a quiz, it would be looking at the larger outcomes. It gives students and learners an opportunity to develop a personalized learning plan. The way that we explain it and visualize it is you’re at a starting line. In a traditional model, educational model, everyone starts at the same spot. In competency-based, it could be that they’re all starting from different places, but to get to that endpoint is going to be different for every person. It is about mastering those skills instead of memorizing them as we did probably in our undergrads and repeating them back. It’s that you have to demonstrate that this is a competency that you completely understand and that you’ve mastered that. It’s interprofessional, give people a flavor of what that means. Because pain is so complex, often I know from my experience that it wasn’t one clinician I was seeing. I wasn’t just seeing my physician. There were many other people involved, other clinicians, physiotherapists, social workers and all sorts of things. It’s so multilayered that we’ve done so much research on pain management works best when it’s in an interprofessional environment. That also includes patients and our family. We’re looking at it as a care curriculum as well. It wouldn’t just be leaving patients outside. They would be actually experts themselves. Did you dial in yet exactly which practitioners are part of it? A lot of the people that we’ve been speaking to are physiotherapists, nurses, psychologists, physicians, and occupational therapist. It could even be speech-language pathologists. It depends. We’re not going to turn anyone away. 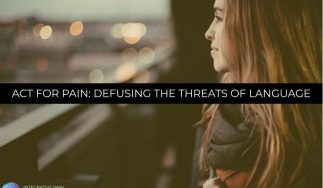 A practicing clinician that has an interest in pain is what we’re looking for from our learners. Pain is so complex that it takes so many people to understand it. How many patients are part of that group? Right now, because we’re implementing it, we don’t have a set number of patients. We would love to incorporate as many as we can. We’ve been in communication with many that have experienced all different kinds of pain. Even those that have experienced the opioid crisis itself. I’ve talked to a patient about that. We want patients to be involved from the beginning. We talked to them when we were developing this type of program but then also throughout the entire process. We’re building it up now. We’ll get to that point that we can include patients as much as possible. People who are living with chronic pain will look at the curriculum you’re developing and give some input. The people with chronic pain, do they have any type of background themselves in education or are there a certain criterion for the people you’re choosing to help support the study? We haven’t yet held a focus group but I definitely want to. I have an idea of what I would like. I would like to see some of those that do have an academic background but not all of them. I think it’s important to include the public and the community as a whole rather than siloing it in just the academic community. Those that have experienced pain that are also academics look at it from a different perspective. It’s important to include everyone. Bring us up to date because that paper is now passed. What’s the evolution of your work been? It’s going to be developing a Master’s level program on interprofessional pain management. The process that we’re in right now is getting it approved by the university. It would hopefully fall into the Master’s of Clinical Sciences and that would be an advanced healthcare practice program. We hope to deliver this program in September 2019. That’s going to be a big challenge. We’re definitely up for it. We have all of the information that we need right now. We have to present it. Obviously, it would be a two-year pro-Master’s. It’s a two-year program, would it be two years long? It would be a one-year long. It could range from twelve months to eighteen. What we would like to see will be a complete distance learning model. It gives them flexibility for clinicians that are still practicing as well as we have opportunities for international students to come in as well. I know you have a model of the framework that helps articulate the program a little bit. Can you share that with us? I’m a sucker for good images and frameworks. Some people love that. I love images that I can paint a picture and tell a story. It’s a great framework. There are a total of five competencies that we’re focusing on. Coming back to that competency-based framework, those are five competencies that learners would have to master. We start out with pain expertise going up to self-awareness and reflexivity, which will be threaded through without the entire program. As a reflective practitioner, that’s so important. It gives you a better sense of who you are, who you want to become and the best way to provide for your patients. Then going into empathic practice and reasoning down into interprofessional collaboration and critical reasoning creativity. Within that, the ultimate goal is creating a competent person-centered partner in pain care. Also doing that would include teamwork, advocacy, and communication that are surrounding it. Also, Socratic reasoning and intercultural fluency which means that we understand that patient and people come from all different backgrounds and being aware of that and partnership as well. Partnering with interprofessionals, partnering with patients and partnering with the community to create this entire piece that creates that competent person-centered care partner in pain care. It’s a lot but I definitely think that it can be done. There’s been a lot of research put into this as well as collaborators from a variety of interprofessional areas. I am proud of what we’ve come up with so far. In the center, you have competent, person-centered, partnered pain care and then the five major parts around are first pain expertise, the next are self-awareness and reflexivity, empathic practice and reasoning and interprofessional collaboration. Finally, critical reasoning and creativity. I want to go self-awareness and reflexivity. Tell us what that is. If you can get into some of the detail about that. Being reflexive is not reflecting on your experiences but bringing them in, together with the knowledge from it, and extending it. Where that came from is I took a course on Reflective Practitioners. That was one of the first courses I took in my PhD. My supervisor agreed with me that this is essential for the learners that we’re going to have in this program to have. Being aware of who you are as an individual and understanding what your biases are when you’re bringing that into either clinic or research. Being reflexive, meaning that you’re not reflecting on your experiences or past experiences, but you’re bringing that in and that knowledge and extending it. That would be promising and understanding that lifelong learning is important so that you’ll continue to do that process. You’ll continue to reflect. When people think of reflection, sometimes it could be, “They’re going to write down in a journal.” That doesn’t necessarily mean what that is. It could be that. I do that a lot throughout my PhD but it could be more than that. It could be creating some artistic piece. It could be an artistic piece that I created in my first year which was a painting. That was how I experienced the course that I took on reflective practitioners. It can mean so many things to other people. That’s what I was trying to say there in that first competency. You have empathic practice, which again is rare. It does show up in pain research. It shows up more in the realm of mindfulness, but tell us how you see that fitting in there. You’ll notice that it’s empathic rather than empathetic. We’ve consulted with many pain experts. That is the proper terminology to use. It comes from psychologists and saying that it’s empathic instead of empathetic. I feel that. Many of the people I’ve collaborated with have said that this is also essential in providing the best person-centered care in the area of pain is providing empathy. Empathy meaning that it’s not that you’re pitying that person or that you’re sympathizing with them. Empowering them and recognizing and validating the pain that they’re experiencing. In doing so, that provides not only a better practitioner but a better relationship with your client, with your patient and with their family members. I love that piece because so often practitioners are not trained in that necessarily. There’s a part of it that sometimes comes to the table with us naturally, but sometimes we have to bring additional awareness to that. It’s a great piece there. It’s a professional collaboration key, that’s probably as far as pain education goes. You probably are the expert more than I am on this. That’s well-researched and well-looked at. You have creativity, which is so interesting to me. Can you talk about creativity there? It’s paired with critical reasoning because that is the scholarly piece. As far as the program, yes, it’s a Master’s program. On the traditional sense, there would be a thesis that you produce at the end of it. In being a scholar, it could be a variety of things. It could be that you’ve already written and published many papers or it could be that you’re going to be developing an excellent case study based on real experiences in your clinical practice. It’s thinking of ways to better help your patients and clients as well. Critical reasoning could be scholarly but then it also comes on a critical appraisal. Determining what’s the best solution for my patient, client, the person that’s involved and then using all of the other tools around you. You sometimes do have to be creative. A good way of looking at this and what I’ve learned in that reflective practitioner course was a lot of the things that we do as practitioners happened in the trenches or in the mud. We have to figure out how to get out of that or how to see clearly. It’s not picture-perfect by the book. If you’re able to do that, that makes you innovative and a good practitioner I believe. Stepping back is always beneficial. Clinicians are busy. They’re seeing patients all day long. There is paperwork. There is a lot of pressure on them on multiple different places. Taking that time to step back is important. Then you have Socratic reasoning. That goes back to the way of thinking in a scholarly way. It would be that critical appraisal piece and thinking in more philosophical ways and looking at larger pictures. It’s not getting so narrow-minded or not necessarily narrow-minded but tunnel vision of what’s at task. Providing a person-centered care to your patient that’s experiencing pain is so much more. We want to look at that in a more holistic perspective. This is still a work in progress? Is there anything that you’re looking at to either add a circle or pop one of the bubbles and change it? I’m pretty happy with where it is now. I think maybe one that I would change is intercultural fluency. That term, I’ve heard it so many different ways. I’ve heard cultural competency before. I’ve heard so many other things. I would like to meet with experts in that area that maybe have clients that necessarily fit into that mold that we see patients. If they could come outside of that, so that could be minority groups. That could be anything just outside of what they’ve already learned in their education, how to adapt that and understand your biases. To use that in a beneficial way to best provide care for a patient that you may necessarily see every single day because everyone is so unique. Pain is so complex. It is important because there are a number of marginalized groups that there’s not a lot of research as far as chronic pain is concerned. You mentioned minorities, African-Americans here in the United States of America, the LGBT community, certain diagnoses, certain pockets around countries, both mine and your country in Canada. That intercultural piece is key. Another example of that would be refugees. That’s a big piece here in Canada too. That’s something that we are trying to implement more into education. It’s not exactly there yet. It has a long way to go. We have to figure out what the best way is and to frame that. I love the framework. It’s great. You’ve done great work. Obviously, people look at this as just five circles, but there are thousands of hours that go behind those five circles. Once the program gets off the ground in a year or two, you’re looking for who to be enrolled in the program? A lot of the things that we do as practitioners happened in the trenches or in the mud. It would be practicing clinicians that would be enrolled in the program. I mentioned those interprofessionals who could be physiotherapists, nurses, etc. I would want them to have an interest in pain. Maybe they feel that’s the area of expertise if they want to go into or maybe they’re ready for a career change. They don’t necessarily have to be in a clinical team. That would be great if they could because then they can take what they have in their clinical environment and then bring that into their learning. It could be that it’s time for them to look for something else and expand their education on pain. Outside of your university, have you gotten any feedback or any buzz about it? When I was at the World Congress, there were so many people that were interested, people who I still connect with all over the world. We had someone from New Zealand come to visit us. People from Australia, they’re the number one in pain research. Definitely from them, other people from the United States across and Canada as well. I would love to tap in more to other countries. Maybe in Europe or in other continents, maybe in Africa as well. The developing countries definitely need some sources for education although I have to say, even in “The United States,” we have a long way to go as far as pain cares. We’ve come a long way too. Things like this are helping pave the way. Zoe, it’s been great chatting with you. Thanks so much for taking the time away from your studies. We know you’re right in the meat and gravy of your PhD study so I appreciate you. I hope this is a nice respite for you. Tell everyone how they can learn more about you and the things you’re up to. If you would like to learn more about what my entire lab is doing, all of us are interested in pain. That is our focus. It’s the Pain and Quality of Life Integrative Research Lab. You can find that on the internet. Our website is www.PIRLResearch.com. If you want to contact me directly, you can also contact me by email. If anyone wants, they can reach out to me personally and I can connect you with them. They can go to the Pain and Research Lab. You can find Zoe as well as her colleagues there and learn all about interprofessional pain education. It’s one of the paths that she has paved. I want to thank Zoe for being here. Make sure to share this podcast out with your friends and family. If you’re new to the podcast, hop on over to DrJoeTatta.com/podcasts. Sign up for the mailing list. In the upper right-hand corner, you’ll see a little box, add your name and email address and I’ll send you the latest podcast directly to your inbox each and every week. Thanks. As a student and former staff member at Western University, Zoe has been an advocate for empathy and a change seeker. In her final year of the Master of Professional Education program, she has learned a variety of pedagogical tools, theories and understand the 21st Century classroom. While challenging herself academically, she also maintained a full-time role as a Curriculum Support Administrator at the Schulich School of Medicine & Dentistry at Western University. Zoe has coordinated and provided support to a variety of pre-clerkship (Years 1 & 2) courses for medical students. Zoe is currently pursuing a Ph.D. in Health Professional Education. If you would like to appear in an episode of The Healing Pain Podcast or know someone with an incredible story of overcoming pain contact Dr. Joe Tatta at support@drjoetatta.com. Experts from the fields of medicine, physical therapy, chiropractic, nutrition, psychology, spirituality, personal development and more are welcome.